Fellas, one day for no apparent reason my LXX perfection bit just stopped working. The main symptom was that the power LED on the controller turned off even though the controller was powered on. I also noticed that the batteries got very hot. 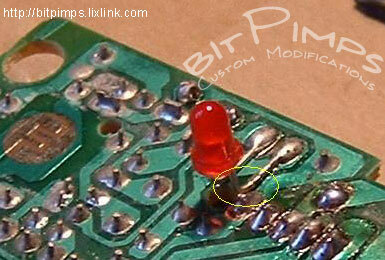 There was a short somewhere on the controller PCB. After a bit of stuffing around and testing with my multimeter I found the problem. The power LED leads were shorting to ground!!! This basically meant that the batteries were shorted and no power was going to the controller circuit. 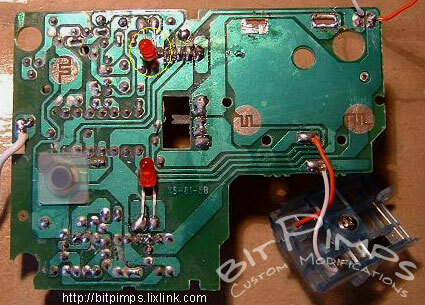 Here’s a pic showing the LXX perfection controller PCB, the power LED is circled in yellow. Here’s a close-up showing the source of the problem. Bloody crappy Chinese QA processes! arghhh! 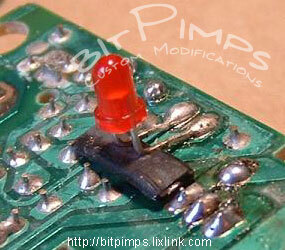 To fix it I put a piece of rubber tire to insulate the LED pins from the PCB. All done. Now she works without any problems. I hope this helps anyone else that has had this problem. This entry was posted on Wednesday, February 18th, 2004 at 2:59 pm	and is filed under Electronics, Micro. You can follow any responses to this entry through the RSS 2.0 feed. You can leave a response, or trackback from your own site.